If there’s one thing we know, it’s that you can take on a huge gaming franchise either by being a much better game or having a stronger IP. TNA Impact! manages to do neither with such style and grace that we’re frankly a little impressed. It desperately wants to be WWE Smackdown – wearing the same clothes and sporting the same haircut, without having any of the parts that make the series as playable or appetising. That’s not to say it hasn’t got most of the things that Smackdown has, painfully shoehorned into bizarre TNA Events, or that it isn’t indeed a wrestling game about wrestlers. The problem is that it’s a pretender and a phony, a game that constantly wants to be something it’s not, and as a result, looks rather ridiculous. You play as any one of the no-namer TNA wrestlers – and Kurt Angle! – such as Shark Boy and Sting (no, not that Sting) and bash your way through the heads and bodies of other wrestlers in Exhibition, Tag Team, Free For All (four wrestlers against each other), and a really bizarre event where you have to make a grab for a gigantic X at the top of the arena. The meat of the game’s unlocks, challenge and, well, point comes in the form of the Story mode. It’s told in a confusing set of flashbacks, where you’re apparently the wrestler Suicide, who gets beaten up after refusing to take a fall in a match, but then he wakes up with amnesia. However, he constantly refers to himself as Suicide – and – well, it doesn’t really make much sense. You wake up so badly wounded that you have to recreate your wrestler from scratch – face, body and all – and then fight through a series of progressively more contrived matches to get back to your former glory. It isn’t particularly interesting, well told, or enjoyable – but as the only way to unlock new arenas in the game, it’s one of the most frustrating requirements of TNA. To play on anything other than an arena in Canada, you have to struggle through the precocious AI, which seems to have a wonderfully old-school habit of ramping up the difficulty just as you’re about to win. What doesn’t help are the controls that are awkwardly changed so as to not completely ape Smackdown, but instead only manage to get in the way of you desperately trying to win. This only gets worse as you deal with more than one opponent. TNA doesn’t really know how to deal with two separate wrestlers at once, choosing one at random and locking you to him. This makes for an awkward game of hoping you’re hitting the right guy – and most of the time unfortunately, you won’t be. The overall experience of TNA Impact! is one of constant mediocrity. It’s a bunch of no-name wrestlers doing the same old moves to each other, with dull graphics (incredible, considering it’s the Unreal Engine 3) and a complete lack of variety in any of the modes. 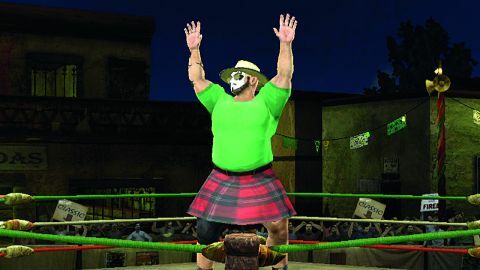 Not even customising your wrestler is particularly fun, and in comparison to the things you can do with Smackdown 2008, it’s actually rather sparse content-wise. How could Midway have thought that this would be an acceptable strategy to take with wrestling fans that have grown used to a glut of superstars, options and modes? In fact, in comparison to just about anything that Smackdown does, TNA is nothing more than a damp squib. While we used the words ‘fun’ and ‘enjoyable’ to describe the latest WWE title, we didn’t even crack a smile playing TNA. It’s lifeless, quirky in all the wrong ways, and tries so hard to make it clear how ultra-serious, cool and important wrestling is which seems to smother any sense of fun you might accidentally have. At least Smackdown has something about it approaching a sense of humour. TNA desperately wants us all to believe that these are men making a living being big and tough, and Midway wants us to feel cool in association by playing their wonky-arsed game. If you’re a fan of wrestling, get the latest Smackdown title – and if you’re a fan of fighting games, get a real one – because this won’t scratch any itch related to fighting, wrestling, or gaming in general. Give it a miss. TNA Impact is little more than a poor Smackdown wannabe. The dodgy controls, bland graphics, and lack of any kind of variety make this a dull affair for even the most diehard of pro wrestling fans. Give it a miss.